Tributes have been paid to Malcolm Huntington MBE, the former York Press sports editor who went on to become a top international tennis umpire, before his funeral on Wednesday. Huntington died at the end of last month at the age of 82 following a short illness. He covered York City for the newspaper for 45 years and was twice named Yorkshire Sports Writer of the Year. He was awarded an MBE for his services to local journalism. His career in journalism began at the former Yorkshire Evening Press in August 1949, where he was a ‘copy boy’, running messages and making tea. 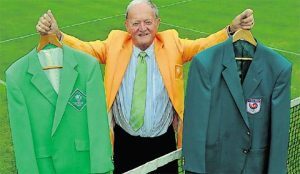 He shuffled his job at the York Press with life as a top tennis umpire and oversaw six Wimbledon finals, as well as officiating at the Olympic Games in 1984 and 1988. He was chief umpire when tennis was trialled at the 1984 Los Angeles Games and oversaw the ladies’ final, won by Steffi Graf. Huntington also umpired the German's first Wimbledon final victory four years later, against Martina Navratilova. Current Press' York City writer Dave Flett said: "In a competitive industry, one of the nicest and most helpful journalists you could wish to meet and a good friend." Chris Stafford, night sport editor at the Yorkshire Post, added: "True gent and great company on and off the golf course." After announcing his retirement from journalism in 2013 following a spell of freelancing, he became York City’s honorary vice-president for a year. Huntington leaves a widow, Gina, a daughter Alex Jane and son John, and four grandchildren. His son-in-law Robert Hardstaff said his health had deteriorated in the past six months, and he had been cared for recently at St Leonard’s Hospice. His funeral service will be held at St Paul’s Church in Heslington on Wednesday.